The balloons are made of reusable food grade plastic and should be replaced every 150-200 fillings to keep flavors pure and clean. These are genuine Arizer products. THIS IS FOR THE BALLOONS ONLY NOT MOUTHPIECES. This 3 foot whip includes the glass mouthpiece and the Glass Elbow Adaptor. Designed for the Arizer Extreme Q and Arizer V-Tower Vaporizer. This Arizer complete whip kit includes the following components: 3 ft of vapor tubing, an Arizer Glass Elbow Adapter, an Arizer Inverse Screen, an Arizer Whip Mouthpiece, an Arizer Glass Cyclone Bowl and an Arizer Glass Stirring Tool. “I have an effective age verification process that satisfies due diligence as described in the Business Companion guide for online age verification checks and I will not sell to persons that are under 18 years old”. This is an all-glass version of the Mini Whip for the Arizer Extreme Q Vaporizer. Used for connecting to balloons, the All-Glass Mini Whip measures 4" in length, includes a screen, and is compatible with the new Arizer Frosted Glass Mouthpiece. "I have an effective age verification process that satisfies due diligence as described in the Business Companion guide for online age verification checks and I will not sell to persons that are under 18 years old"
This is an original manufacturer's part for a guaranteed perfect fit every time. Screen Pack is intended for use with the Arizer Extreme Q Vaporizer. What's in the Box: 2 x Rimmed Dome Screens 2 x Flat Screens “I have an effective age verification process that satisfies due diligence as described in the Business Companion guide for online age verification checks and I will not sell to persons that are under 18 years old”. This is an original manufacturer's part for a guaranteed perfect fit every time. Made using only the highest quality materials to ensure a smooth, clean vapor. 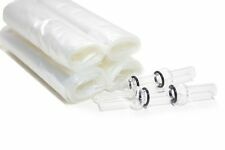 Balloon Kit (Bags) are intended for use with the Arizer Extreme Q Vaporizer. Includes: 4x Balloons 2x Glass Balloon Mouthpieces 4x O-Rings For aromatherapy use only - no nicotine included. “I have an effective age verification process that satisfies due diligence as described in the Business Companion guide for online age verification checks and I will not sell to persons that are under 18 years old”. ARGO Kit (Arizer). Charging an interchangeable 18650 battery cell via USB, this fast heating unit is a major force on the market for all your dry herb vapourising needs. 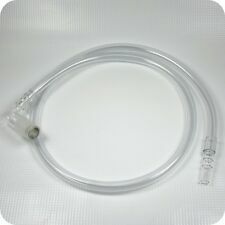 This is made by Easy Flow, and not by Arizer. This Easy-Flow long mouthpiece allows extra airflow into your Arizer Air or Arizer Solo's heat chamber, so that you can easily inhale deeply and produce big clouds. 2 x Arizer Disc Screens. This is a replacement part for the Arizer Extreme Q vaporiser. This is the official Arizer part, so is of the same high standard. “I have an effective age verification process that satisfies due diligence as described in the Business Companion guide for online age verification checks and I will not sell to persons that are under 18 years old”. TheArizer Solo 2 is the updated and upgraded version of one of our absolute favorite portable vapes, the Solo Vaporizer now available in BLUE. 1pc Glass Aroma Dish. Not only does it look great, but It's small enough to fit inside your pocket and weighs less than 2 lbs. NEWEST MODEL Since we are one of the few authorized Distributors of Arizer products, we are proud to carry the latest model of the Arizer Solo Vaporizer. When you’re done the automatic-shut off ensures that none of your herb is wasted. How easy can vaping get?. Its integrated triple heat sensor ensures that your dry herb is evenly and thoroughly heated, producing thick, potent, and tasty vapor. V Tower Vaporizer - Arizer. 1 x Arizer V Tower. 1 x potpourri glass bowl. 1 x Cyclone glass bowl. If you go to a party, just grab your bag and go. You will end up spending less on replacing lost pieces. Get yours now. Carry Cases. - Custom Cut Foam to cradle your unit. - 4 Outer Pockets for accessories. With a battery life of two hours with constant, continuous use, the Arizer Solo is one of the highest and strongest quality vaporizers on the market; why wouldn't you choose this sleek and portable vaporizer?! Genuine replacement wall charger for the portable Arizer Solo Vaporiser. “I have an effective age verification process that satisfies due diligence as described in the Business Companion guide for online age verification checks and I will not sell to persons that are under 18 years old”. Glass Tuff Bowl with flat screen. The same as the Cyclone Bowl, but it's surrounded with high impact heat-rated material to protect the glass from shattering and make it easier to handle when hot. "I have an effective age verification process that satisfies due diligence as described in the Business Companion guide for online age verification checks and I will not sell to persons that are under 18 years old." This unit utilizes only the highest quality toxin free glass that produces pure and clean vapor. The V-Tower Vaporizer also utilizes the vertical Cyclone Bowl that ensures proper heat distribution for an efficient vaporization process. 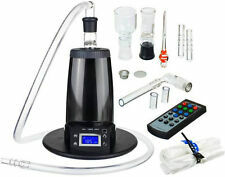 Arizer Multi Listing - Extreme Q - V Tower - Solo - Spares - Select Your Item! 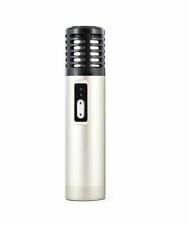 Arizer Air - Small Size, BIG Performance! 1 x Owner’s Manual. Compatible with dried aromatherapy blends. The Air is sleek and easy to carry around. It fits into your pocket is made with a solid shell to protect it from wear and tear. Portable Vaporizers. Isolated Air Path for the Purest Vapor. Boro-Silicate Glass Vapor Path. Most Flavourful Vapor. 50% Higher Battery Capacity. Faster Heat Up. USB Charging. Use While Charging. TheArizer Solo 2 is the updated and upgraded version of one of our absolute favorite portable vapes, the Solo Vaporizer. 1pc Solo 2 (Carbon Black). 1pc Glass Aroma Dish. The Arizer Solo 2 is a great device and gives you all the freedom you want with your device. Therefore, you can set your device to the exact temperature you’re after. The Arizer Solo 2 also features a digital screen, which when powered on will display the current temperature, the pre-set temperature and also the current battery life. The incredibleArizer ArGo Vaporizer is a discreet, fully functional and compact vaporizer that will fit in the palm of your hand and has been brought to you by Arizer -one of the world'd leading vaporizer makers-. Now you can charge your Vape on the Go! Use this convenient Car Charger for the Arizer Solo Vaporizer to ensure a full battery at all times. “I have an effective age verification process that satisfies due diligence as described in the Business Companion guide for online age verification checks and I will not sell to persons that are under 18 years old”. This is a 90mm tall glass aromatherapy bowl for the Arizer V-Tower and Extreme-Q Vaporizers. The black coating ensures that the end stays cool enough to touch. A metal screen is included. “I have an effective age verification process that satisfies due diligence as described in the Business Companion guide for online age verification checks and I will not sell to persons that are under 18 years old”. The Arizer Solo Aroma Straight Tube Mouthpiece. 1 x Glass Aroma Tube (Straight). The unit's straight design prevents the build up of reside inside the tube and promotes easy cleaning. Portable Vaporizers. We have a high standard of age verification checks and due diligence. By purchasing this item you are confirming that you are over the age of 18 years old. However, we will still require the following checks in order to authenticate yourself and your age for our records. Arizer Air - Small Size, BIG Performance! The Air heats up in less than 90 seconds and has 5 different levels of preset temperatures, similar to the Solo. The chosen setting is indicated by one of 5 different color lights. The Arizer Glass Elbow Adaptor is designed for use with the Extreme Q Vaporizer and V-Tower Vaporizer. Arizer Elbow Adapter is all glass construction. 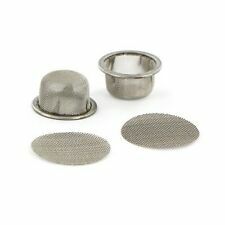 It's always great to have spare parts - a must have for every Arizer owner! This is a genuine Arizer product. “I have an effective age verification process that satisfies due diligence as described in the Business Companion guide for online age verification checks and I will not sell to persons that are under 18 years old”. This is an official spare part for Arizer Solo vaporizer. This straight mouthpiece is made from high quality glass and comes with a built in glass diffuser screen. “I have an effective age verification process that satisfies due diligence as described in the Business Companion guide for online age verification checks and I will not sell to persons that are under 18 years old”. Arizer Air - Small Size, BIG Performance! Compatible with dried aromatherapy blends. The Air is sleek and easy to carry around. It fits into your pocket is made with a solid shell to protect it from wear and tear. Coloured protective silicone skin for the Arizer Air provides added durability and insulation, not to mention some flashy customization options. “I have an effective age verification process that satisfies due diligence as described in the Business Companion guide for online age verification checks and I will not sell to persons that are under 18 years old”.